A new Ottawa research study shows that “triple negative” breast cancer — a particularly aggressive form of the disease — can be successfully treated in mice with a combination of immunotherapies that weaponize the immune system in different ways. The study was published Wednesday in Science Translational Medicine, a journal devoted to research that advances the prevention, diagnosis and treatment of disease. It found that the immunotherapies were much more powerful when used in combination than alone. Researchers at The Ottawa Hospital found that staged immunotherapies (an oncolytic virus before surgery followed by a checkpoint inhibitor after it) cured 60 to 90 per cent of mice with triple negative breast cancer, an aggressive form of the disease now treated with limited success using surgery, radiation and chemotherapy. Used alone, neither the checkpoint inhibitor nor the Maraba virus had a significant impact on overall survival rates with surgery. The study’s lead author was Dr. Marie-Claude Bourgeois-Daigneault, a postdoctoral fellow in Dr. John Bell’s research lab. Read the full Ottawa Hospital Research Institute article here. 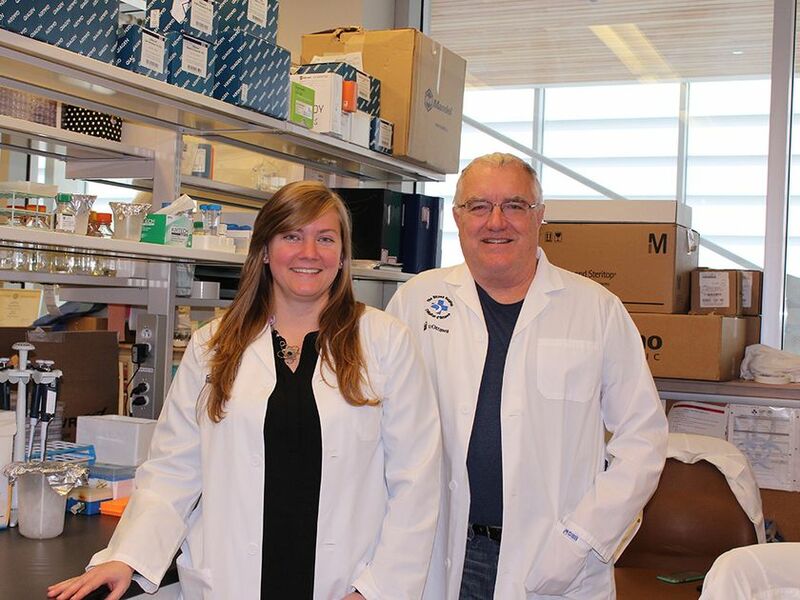 Cancer postdoctoral fellow Dr. Marie-Claude Bourgeois-Daigneault with Dr. John Bell, co-authors of a new study on using a combination of immunotherapies to cure an aggressive form of breast cancer.